Whenever we are in Normandie, Saturday means only one thing, a day out in Honfleur. 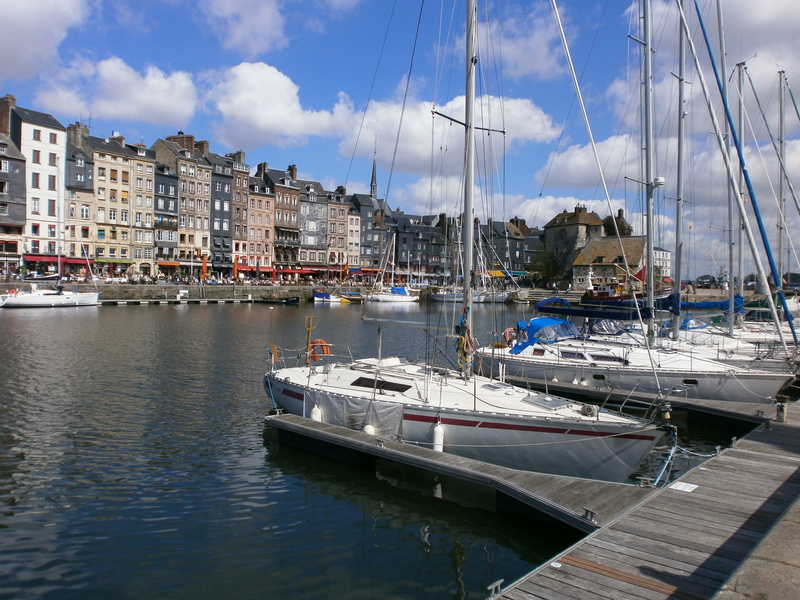 Honfleur is a beautiful fishing town at the mouth of the Seine and is famous for several reasons. Firstly, it was from Honfleur that the explorer Samuel de Champlain left to discover Canada in the 1500’s. 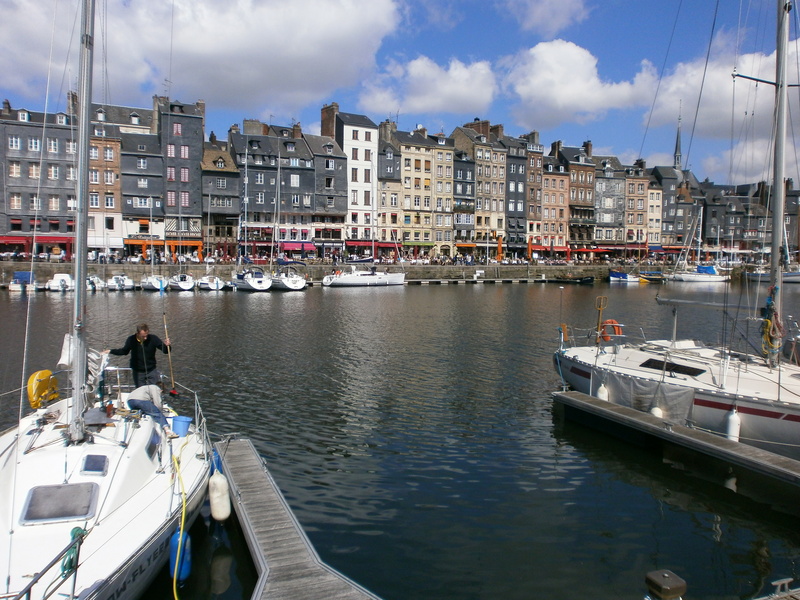 Honfleur is also said to be the birth place of Impressionisim; local artist Eugene Boudin, followed in the steps of Turner experimenting with painting various different weather conditions and passing on his ideas to other Impressionist artists such as Claude Monet. 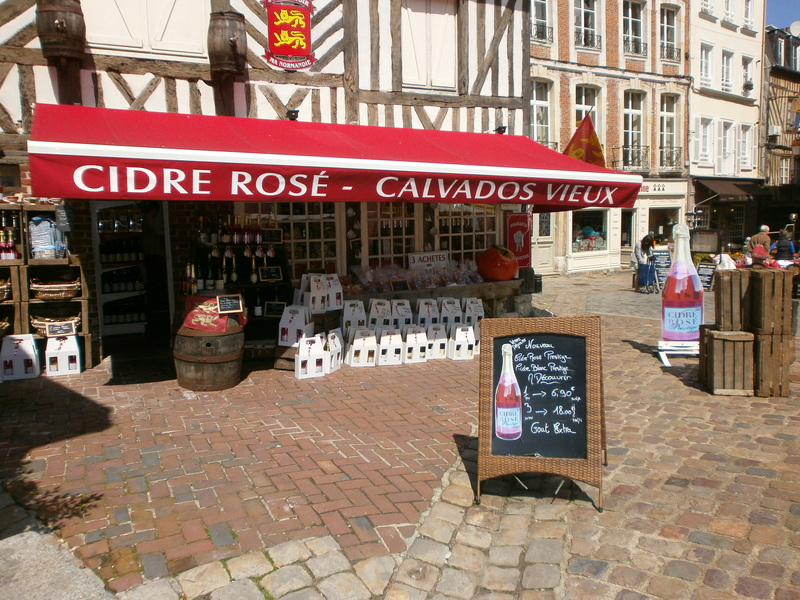 Honfleur first became prosperous due to salt and is sill famous for salt and seafood today. In the 16th century, Fishermen began to venture further afield for their catch and needed a way to preserve the fish until they returned home and so, used salt. End of history lesson!! 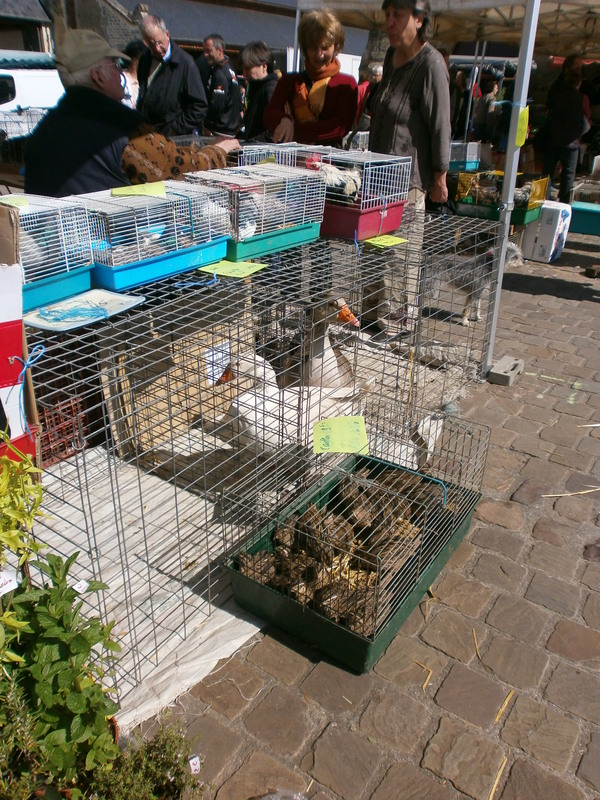 The market each Saturday in Honfleur is a mixture of clothes, household goods and food. It is a vibrant affair frequented by a tourists and locals alike. 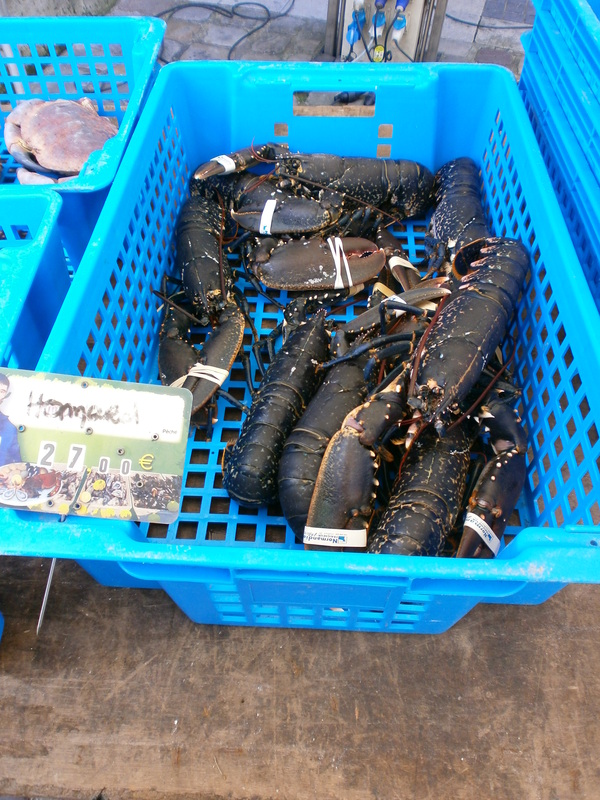 The prices may be a bit steaper than other local markets or supermarkets but, as many Parisians spend their weekends in the port town, what else would you expect! Being me, I was more interested in the food part of the market. 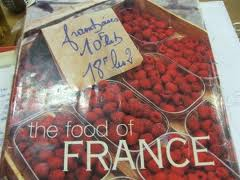 There was a wonderful array of vegetables, meats, cheeses with some stalls simply selling strawberries or honney. 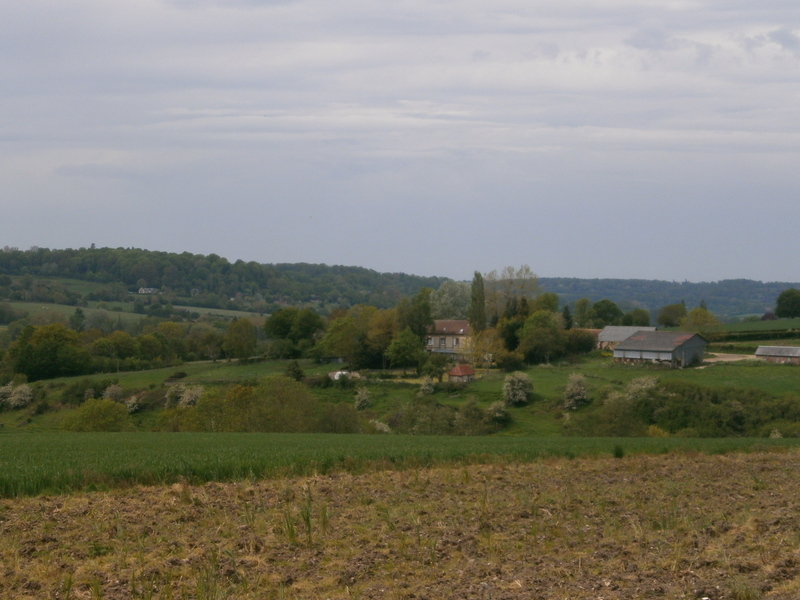 The majority of goods were produced by sellers local to Honfleur or artisan farmers in the Normandie region. 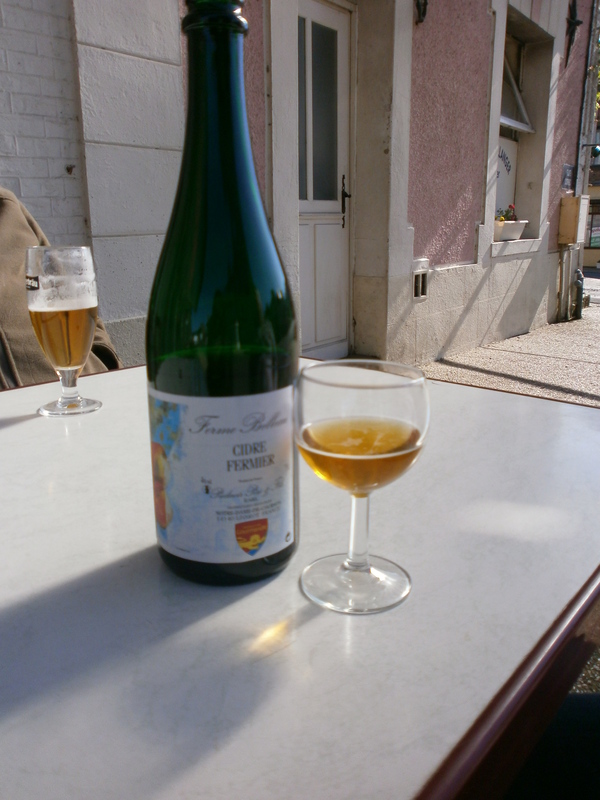 Mr MAC sampled some delicious cider made in nearby Pont L’Eveque. I sampled the apple juice from the same farm although this was very tasty too. As a treat, we decided to purchase a few bottles of each. 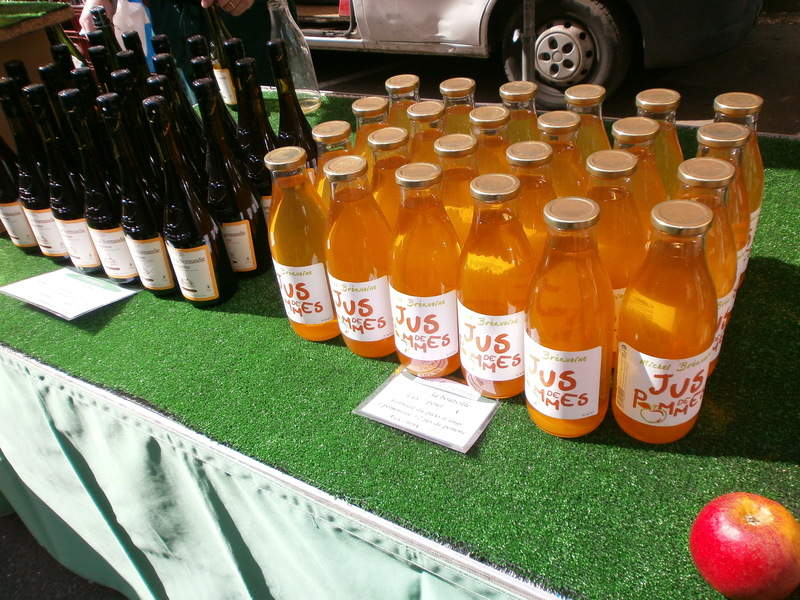 Cider on the market is generally a few euros more expensive than you can expect in the large supermarkets however, I like supporting local farmers and purchasing local products. 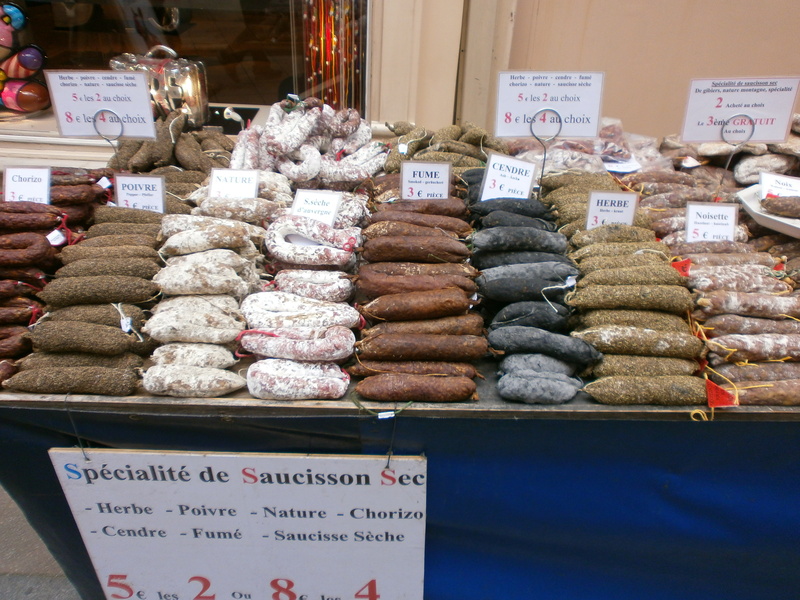 We also sampled some saucisson. As my boyfriend is a big fan of chorizo, I thought this delecacy would appeal to him. We chose a ‘natural’ and a ‘smoked’ although there was a large variety of flavours on offer such as roquefort, venison and camembert. We thoroughly enjoyed the saucisson although Mr MAC still reckons he prefers chorizo and I would be inclined to agree with him; saucisson is much fattier. 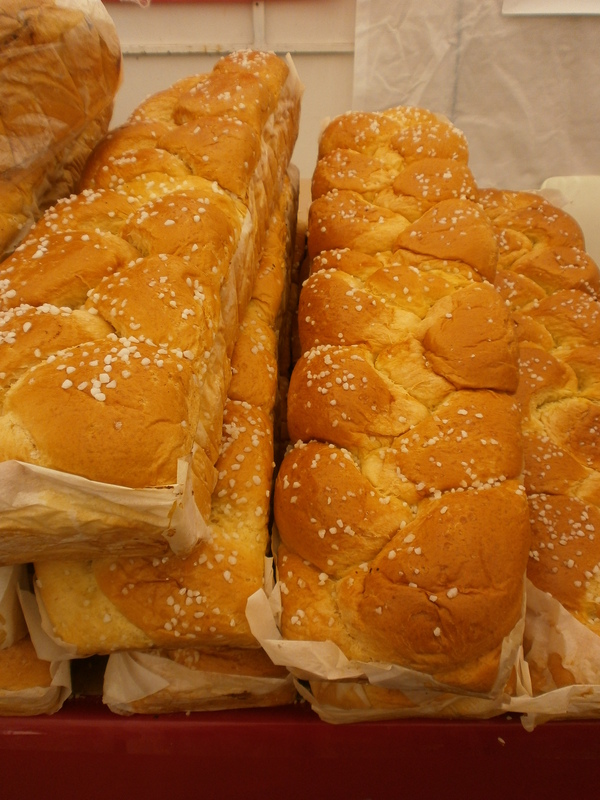 Of course, we had to stop by the patisserie and purchase some french bread. My other half adores french sticks and I think this was the main appeal of coming to France for him!! In our limited French, we managed to purchase a French stick and a larger loaf. There were so many other delcious looking temptations on offer from almond crossiant, a loaf that looked like it had raspberries or strawberries in, almond crossiants and a loaf containing lardons et camembert (baacon and cheese)! My parents also wandered round the market buying strawberries, melon and medjoul dates. All the fruit and vegetables looked so big and fresh, definitely aa contrast to what you can buy in your local Tescos. After a beautiful long lunch, we couldn’t resist looking in some of the foodie shops around the town. 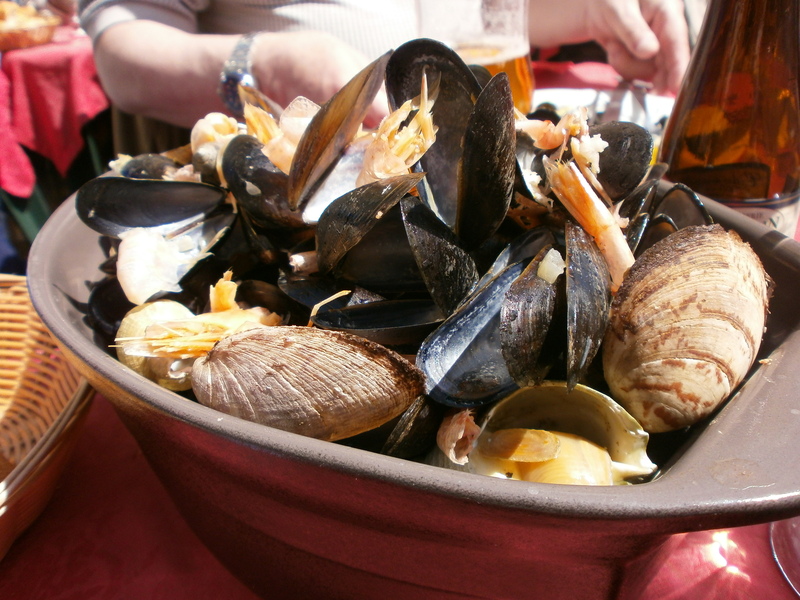 If you are a foodie and love cooking, Honfleur is the place to be! There are numerous shops selling cider and calavados, beautiful looking patiseries selling macaroons, pastries and indulgent looking chocolate creations, tea shops, chocolate shops and even a shop that specialises in sardines!! We couldn’t resist making purchases from Real Chocolate. 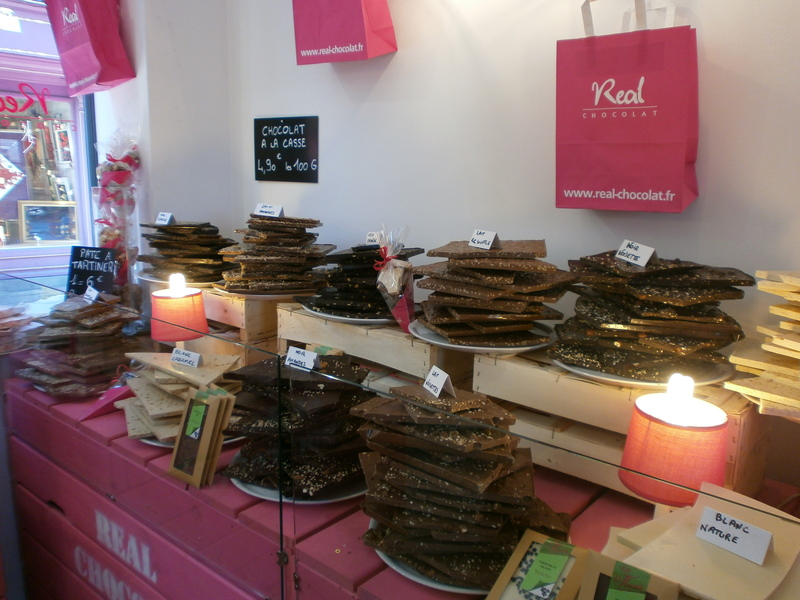 This shop is a little bit pricey ( 4 Euros 85 per 100g of chocolate balls!!) but it was also delicious. my boyfriend and I purchased different flavoured chocolate balls such as tarte tartin (apple), framboise (raspberry) and caramel et sel (caramel and salt) which all had a crispy center, kind of like Maltesers. We didnt get much value for money though as we only got about 16 Malteser sized chocolates for 4 Euros!! Mom and Dad decided to go for some pistachio nougat, about 8 Euros for a medium piece!!! Maybe more of a place to go for a special occasion. 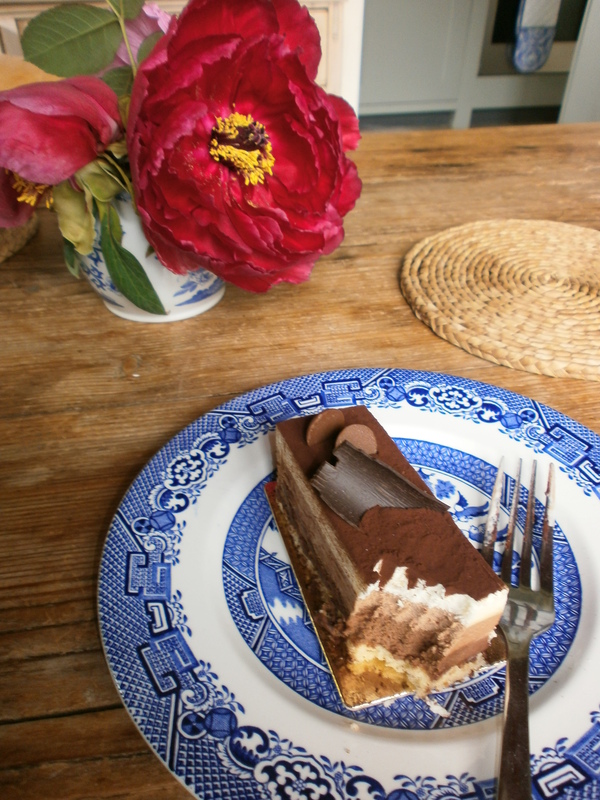 Honfleur is without a doubt a foodie’s paradise. With beautiful restaurants, architecture, shops and markets you really cant go wrong!! Definitely worth visiting on a Saturday but be aware, the market is all over by 1pm! Honfleur and it’s weekly Saturday market are always a must when we visit Normandy, just as a long lunch at Le Corsaire is before the journey back to the cottage. 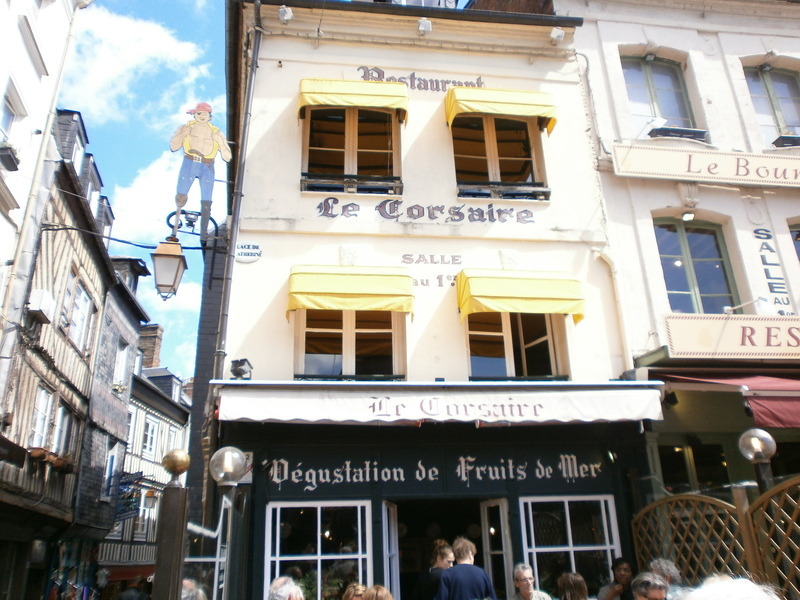 Le Corsaire is a rather traditional French restaurant in the centre of the port town. It is a short distance away from the main harbour which, although perfect for people watching and the ideal place to ‘be seen’, the food invariably lacks quality and is severely overpriced. This is not the case at Le Corsaire. My family and I must have been coming to Le Corsaire for 10+ years on our visits to Honfleur. The staff, menu and decor remain much the same however, this is what makes the place so charming! Their service is good and it is a great place to sit outside if you are blessed with a sunny day so that you can listen to the clarinet player in the square (who also must have been doing the same route for 10+ years!!). A warning, it does get very busy so booking is essential. The restaurant also, like many traditional restaurants in the area, serves food at specific times rather than all day so try not to get caught out otherwise you will miss out on a truly lovely meal. As with the majority of French restaurants, there are set menus which vary in price. The four of us, my Mom, Dad, Mr MAC and I, all opted for Le Menu 15,50 E which offered a choice of five starters, four main courses and three desserts. Very good value especially considering the dishes that were on offer. My Dad, being an avid seafood lover, chose ‘Assiette de Fruits de Mer’ (mixed seafood plate) for a starter. My boyfriend is not quite so much of a seafood lover but due to where we were, he thought he would give it a go. The dish contained quite a selection, oysters, sea snails, prawns and whelks accompanied by seaweed and mayonnaise. Dad, of course, was overjoyed however, my other half did look a little green when the dish was delivered to the table!! I cannot honestly say that they both thoroughly enjoyed it although I think that is because Mr MAC is not a massive fan of seafood rather than the quality of the food! My Mom and I also chose a seafood option to start, Moules au Creme (Mussels in a shallot, garlic, white wine and cream sauce) for my Mom and Moules Marinere (the same but without cream) for me. The portion was very generous however, I will say that the mussels weren’t as big as normal as they are slightly out of season. They were still delicious thought and the wonderful sauce was mopped up with an abundance of white french bread. Calorific, yes but it certainly was a fantastic gastronomic start to the holiday! 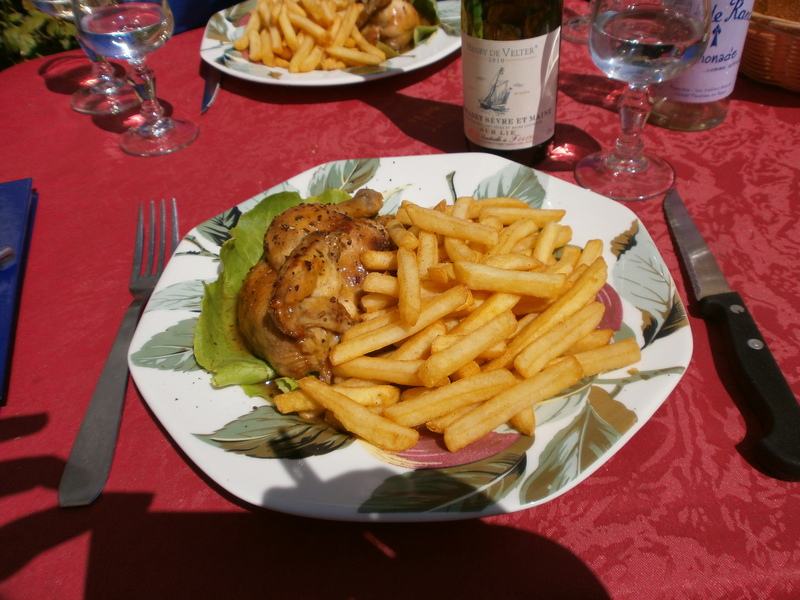 For the main course, my Mom and I again chose the same dish, 1/2 Coquelet Braise au Calvados (Chicken quarter with Calvados sauce) which came with a large portion of crispy frites (chips). 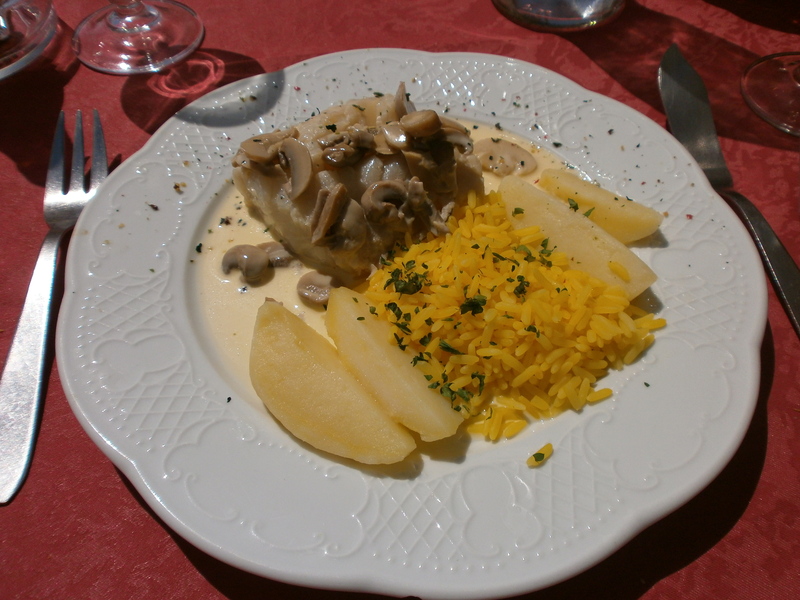 The sauce was really creamy and there was certainly a strong taste of Calvados although it was not overpowering. 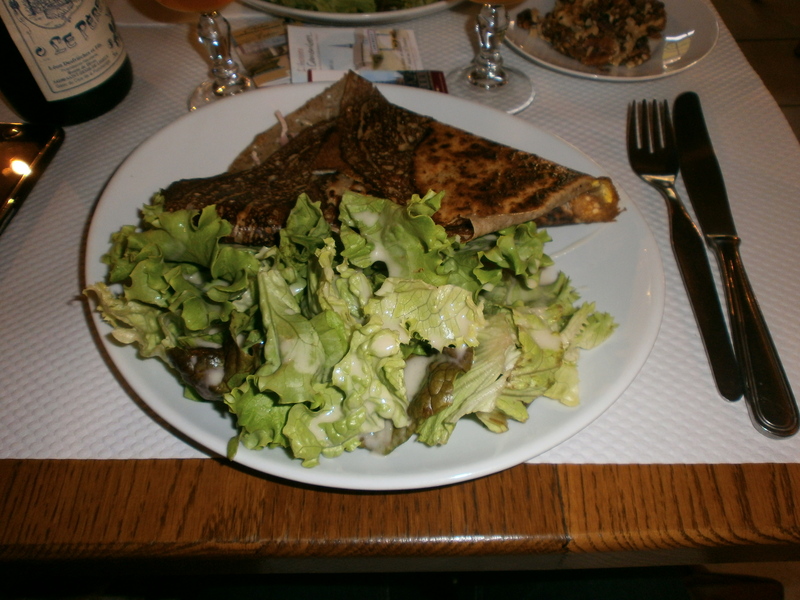 Also on the plate was a single lettuce leaf; I must admit I would have preferred a bit more salad or veg however, I know that is not the French way. Although it may seem like we simply ate chicken and chips, the sauce added another, more local, dimension to the dish. Mr MAC opted for seafood that he is more at home with, Saumon a L’Oseille (Salmon with a sorrel sauce). 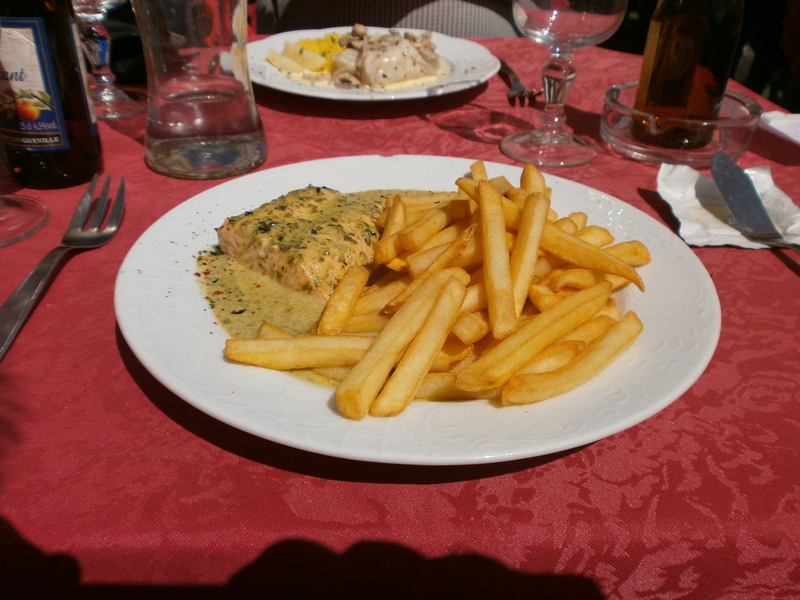 He also chose to have a side of chips – it was the first day of our holiday after all!! He really enjoyed the sauce which had a beautiful lemon flavour. The salmon fillet was also perfectly cooked, flaking easily. As my Father can never get enough fish, he decided upon Filet de Poissons a la creme (Fillet of fish with a cream sauce). This turned out to be the fish of the day, Cod, which was very meaty and the perfect variety of fish to have with the delicate creamy sauce. My Dad opted to eat most of my Mom’s chips and instead had boiled potatoes and rice. An odd combination perhaps and again a distinct lack of veg however, the sauce did have one or two mushrooms in it!!! By this stage we were all rather full but who can resist a French dessert? 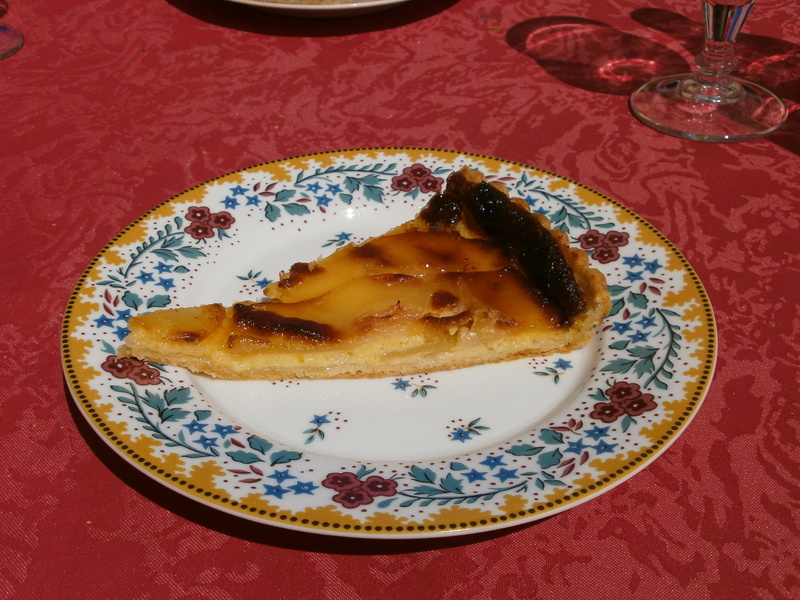 I chose the speciality of the region, Tarte au Poire (Pear Tart) which was served warm. Absolutely lovely, the pastry was nice and buttery and not too thick. 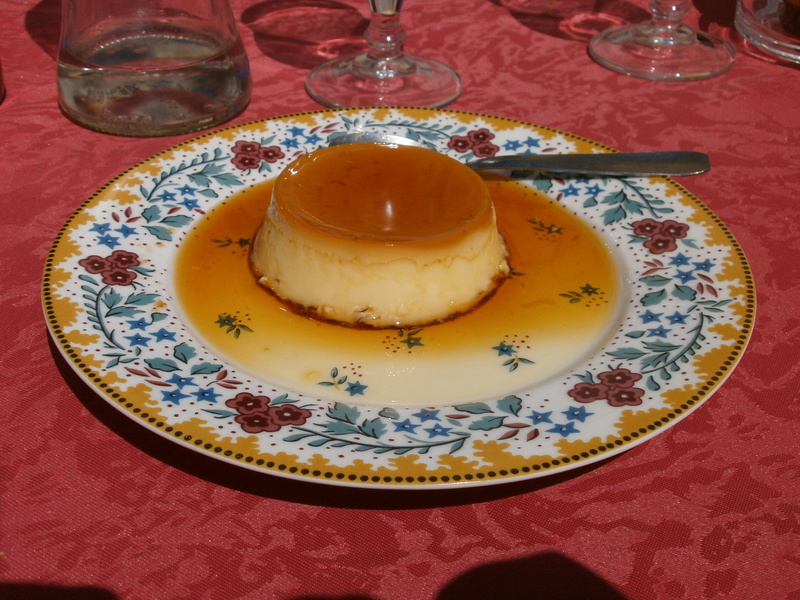 Everyone else opted for the Creme Caramel Maison (Creme Carmel) having seen several other tables opt for this already. Very creamy with just the right about of wobble I am told! 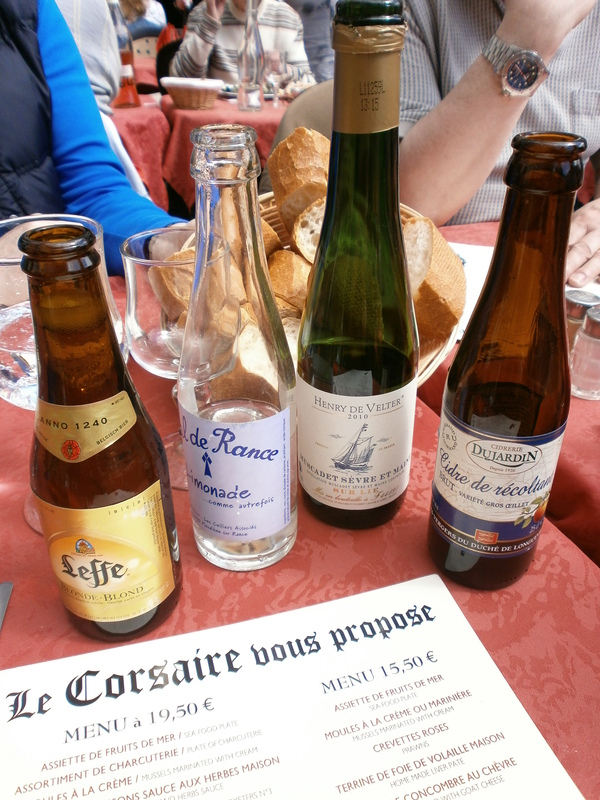 Being in France, it would have been rude not to have a few drinks with lunch. Mom was on the red wine, Mr MAC had local cider and Dad had a beer…I had a lemonade as I was on antibiotics! We all felt the need for a nap on the way home after such a lovely, and typically French, lunch in the sunshine. It really was a wonderful start to our holiday. And now for a recipe for Moules Mariniere from ‘The Food of France’ (Murdoch Books recipes by Maria Villegas and Sarah Randell). 1. Scrub the mussels and remove their beards. Discard any that are open already and don’t close when tapped on a work surface. 2. Melt the butter in a large saucepan. Add the onion, celery and garlic stirring occasionally until softened but not brown. 3. AAdd the wine, bay leaf and thyme and bring to the boil. Add the mussels, cover the pan and summer over a low heat for 2-3 minutes, shaking the pan occasionally. 4. 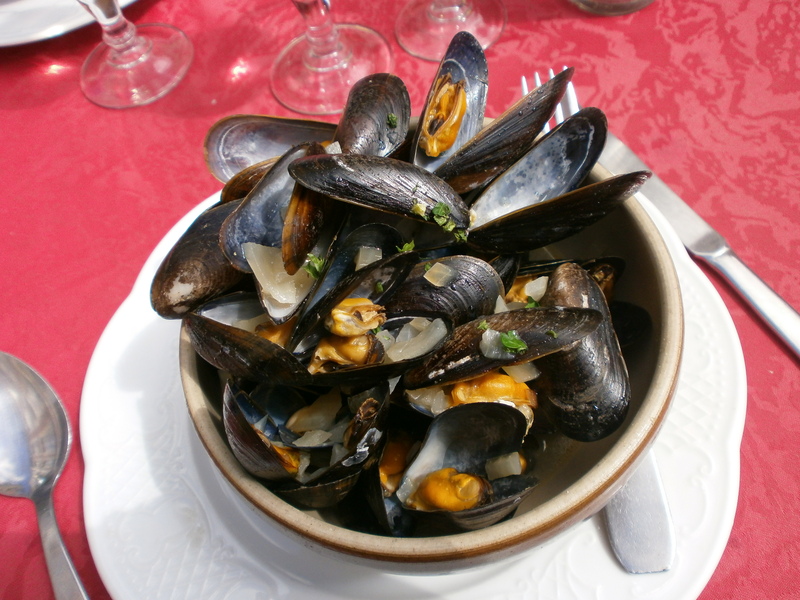 Using a slotted spoon, lift out the mussels as they open putting them in a warm dish. Throw away any mussels that havent opened after 3 minutes. 5. Strain the remaining liquor into a clean saucepan through a sieve. Bring to the boil and allow to bubble for 2 minutes. Add the cream and reheat the sauce being careful to not allow it to boil. Season well. 6. Serve the mussels in bowls with the sauce poured over and parsley sprinkled on top. Ensure there is plenty of bread for dunking!! You may have wondered why I have been rather quiet over the last ten days or so. Then again, you may not have noticed the distinct lack of posts. I rather hope, that for at least one person, it was the former, but that is my self-indulgent side talking!! 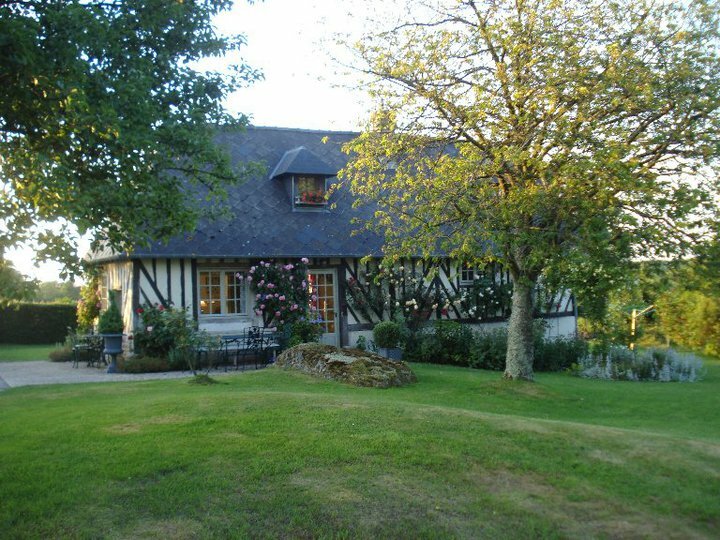 Anyway, I have been fortunate enough to have had a short break in Normandy, France not far away from Lisieux staying in the below converted apple barn; you could not ask for a more tranquil and picturesque setting I am sure you will agree!!! 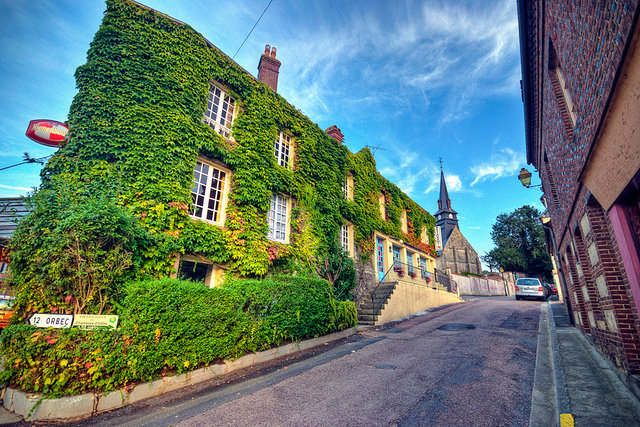 Normandy is France at its most antiquated but it is also incredibly beautiful, full of lush green valleys and half-timbered barns as well as hidden chateaus and wonderfully crumbling shuttered houses. The region is rich with history from the first world war however, this is not the only reason people visit the area; it is also a foodies’ idea of heaven and locals are extremely proud of the region’s culinary products! 1. 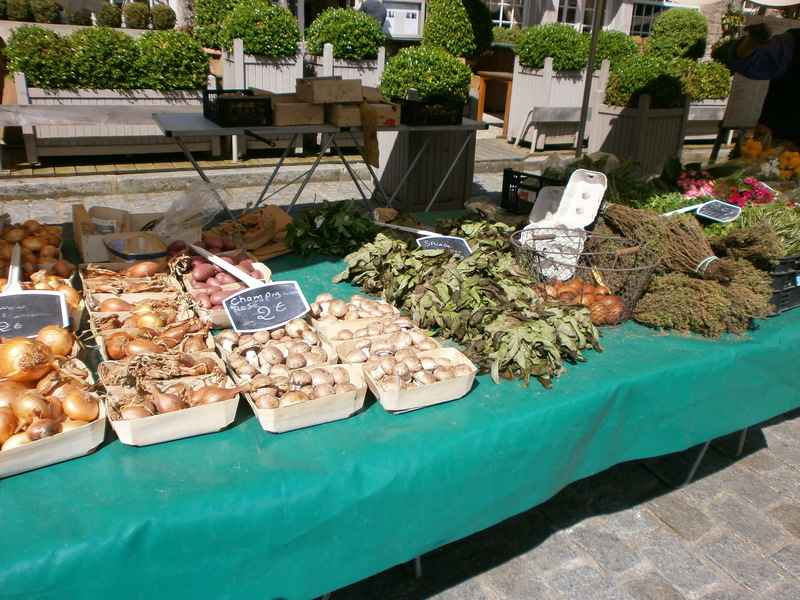 Spend the day in Honfleur wandering around the market and numerous foodie shops. 2. Visit local markets, again and again and again!! During the first three days of our stay, we visited three markets (I’m not kidding!!). Although you may say ‘Seen one market, seen them all’, I really wouldn’t say this is the case. 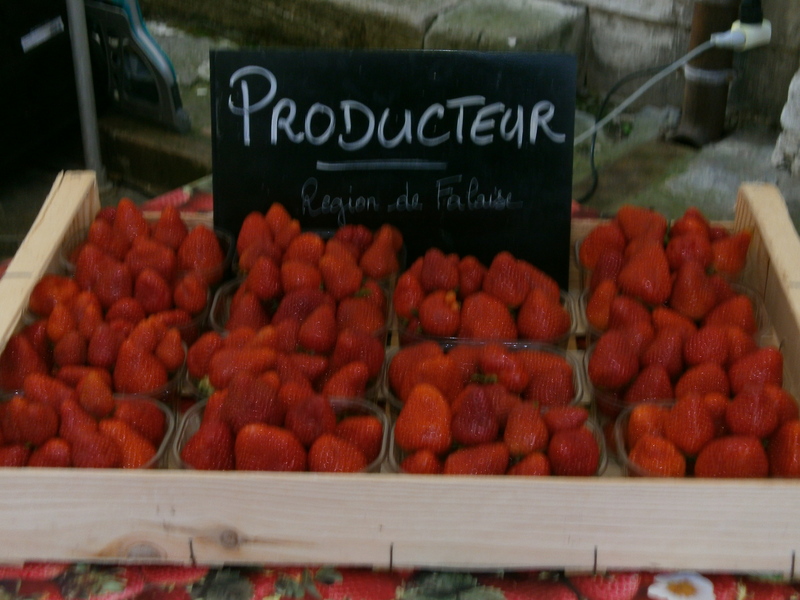 The array of goods on offer from local producers at French markets is truly fantastic, so fantastic in fact, that you would rarely need to visit a supermarket as long as you didn’t mind the French’s lax attitude to health and safety laws….! 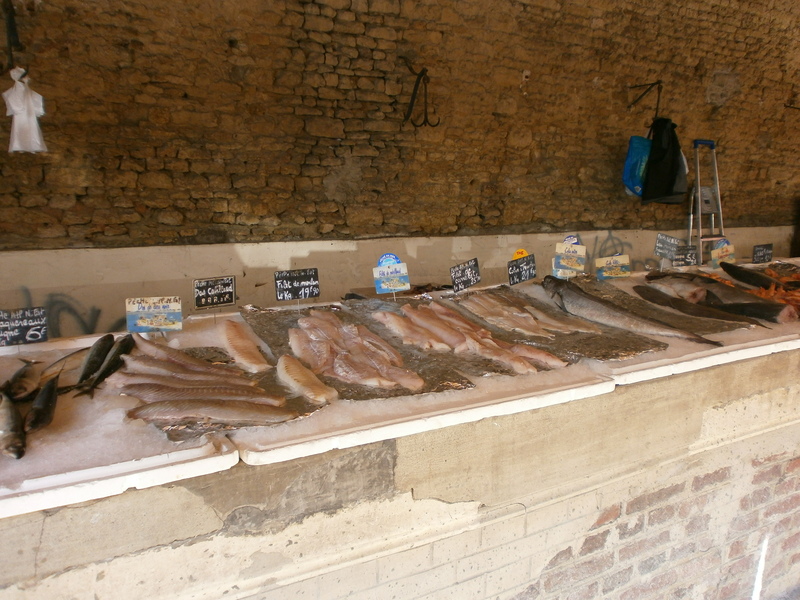 The market at St-Pierre-sur-Dives each Monday is, in my opinion, one of the best local markets to visit. The beamed market hall is a reconstruction of the original 13th century building which was badly damaged in World War 2 and is the hub of activity with local honey, saucisson and even live animals on offer. 3. Wake up at the crack of dawn to buy fresh croissants and bread from the local patisserie. There really is nothing better than a fresh French stick…in fact, my boyfriend really couldn’t get enough of the stuff!! 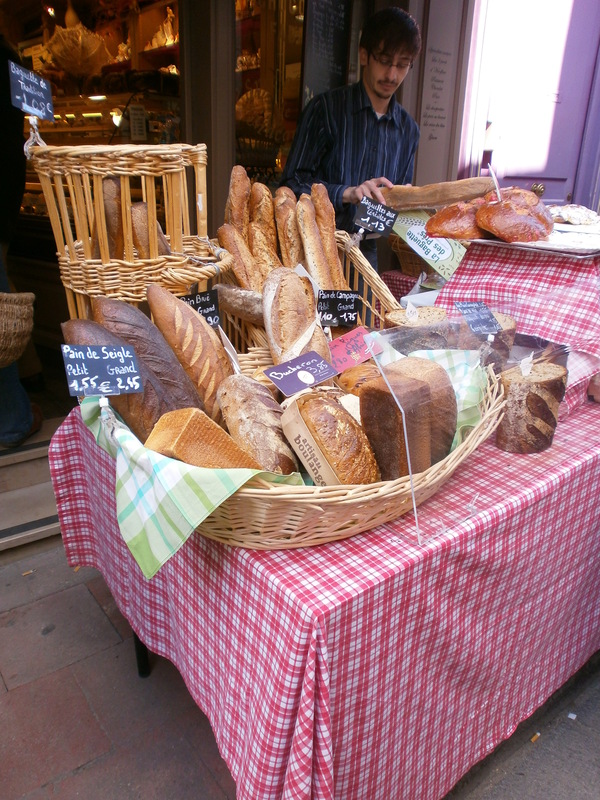 Apparently it is required by law that there is somewhere to buy bread in each village in France so obviously, there is no shortage of patisseries so take advantage!!! The pastries produced at these local bakeries are also superb and well worth a try; tarte au pomme is a regional speciality. 4. Become a cheese expert. There are so many wonderful cheeses produced in the region from Pont L’Eveque to Camembert so there is no excuse! 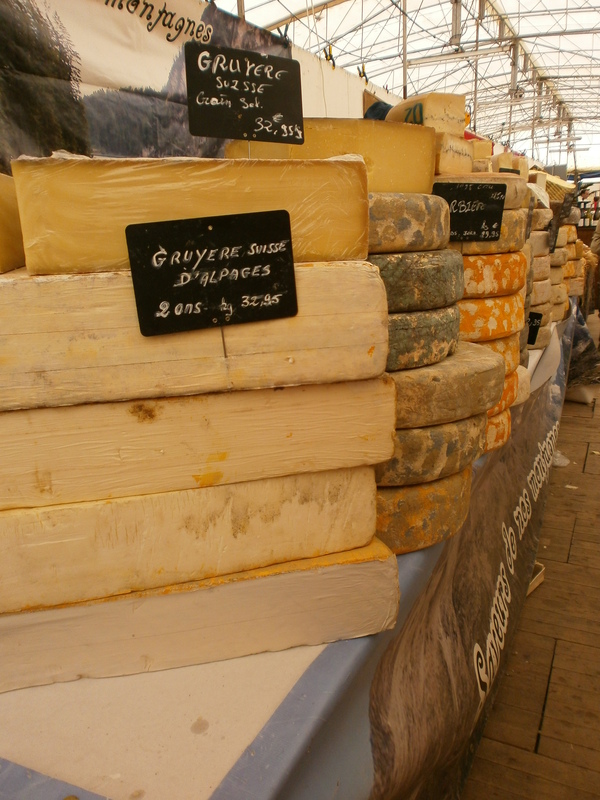 There are cheese museums at Livarox and Camembert that, I believe, provide tours in English. 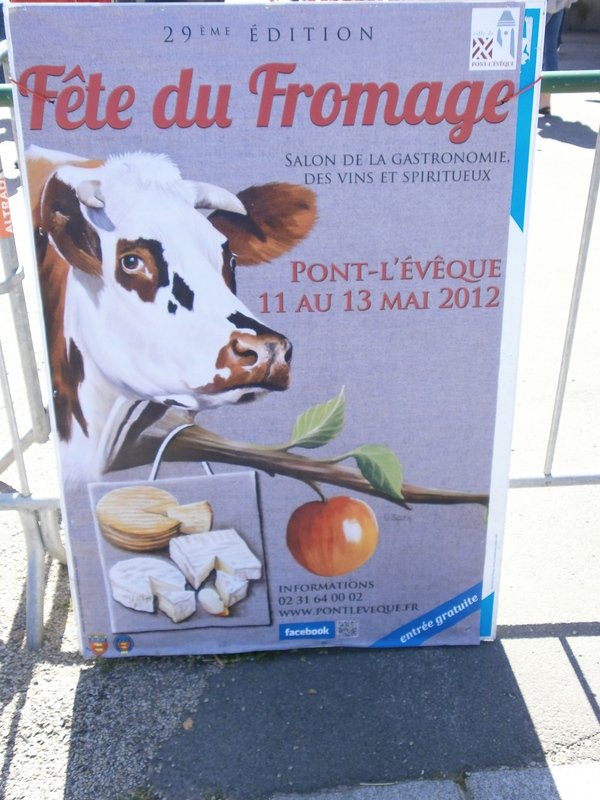 We were fortunate enough to attend the annual Fete du Fromage in Pont L’Eveque during our stay. 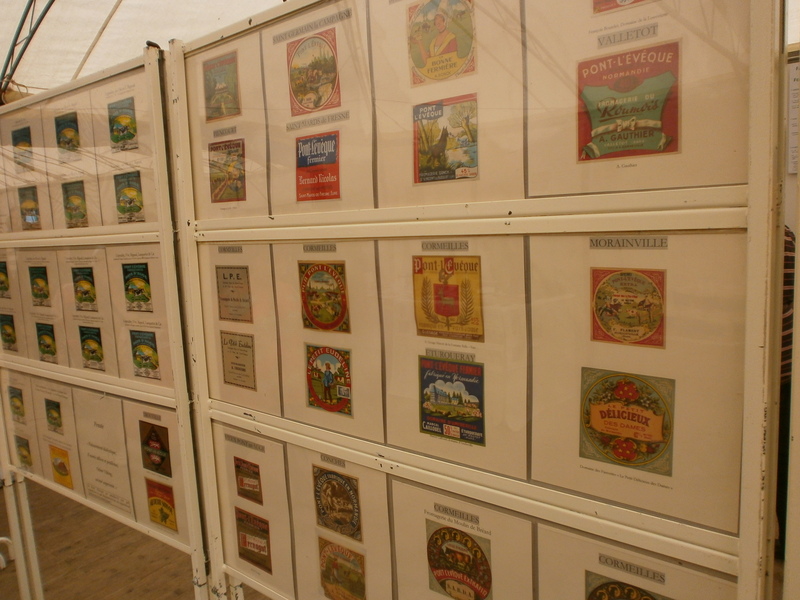 The array of cheese on offer was tremendous and the smell was immediately overpowering as soon as you entered the tent!! 5. Make a complete mess of yourself eating Moules. When visiting Arromanches, I managed to not only make a mess of myself but also my handbag, my glass, the wall behind me and even the table next to me which was (fortunately!) empty!! Needless to say, my moules bleu (mussels with white wine, shallots, garlic, cream and blue cheese) et frites (chips) were very indulgent but thoroughly enjoyed!! 6. 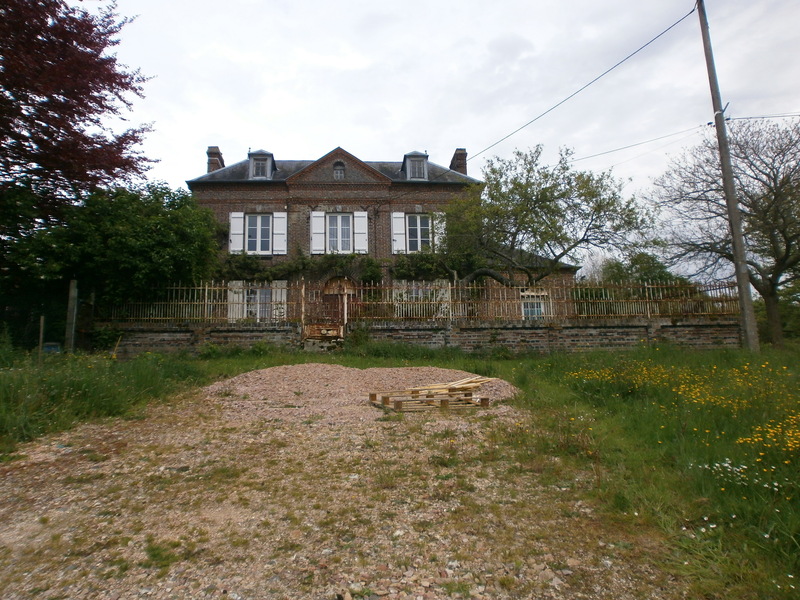 In garbled French, buy a few bottles of cider from the crumbling farm-house where it is produced. 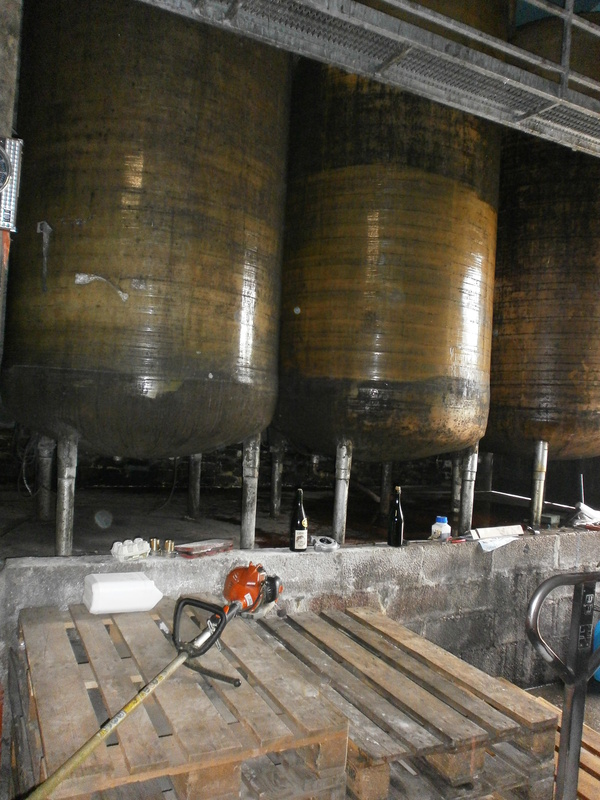 It will be well worth the effort and embarrassment as it WILL most probably be the best cider you have ever tasted. 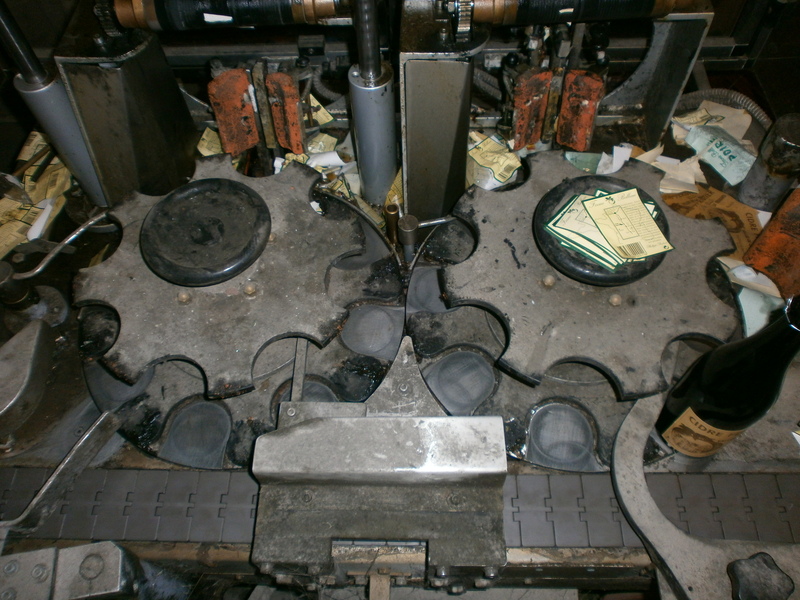 We were lucky enough to even see the cider being labelled in an ancient press at Ferme Belleau, Notre Dame de Courson. 7. Overindulge. So much so that you never want to see cheese, pate or bread ever again and gain at least half a stone in a week!! 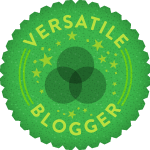 The rich, creamy and hearty food of Normandy sure is delicious but by the end of a week, you will be craving vegetables like you have never craved them before in your life!! How the majority of French people are so slim and energetic, I will never know!!! 8. Do eat at the local restaurant . 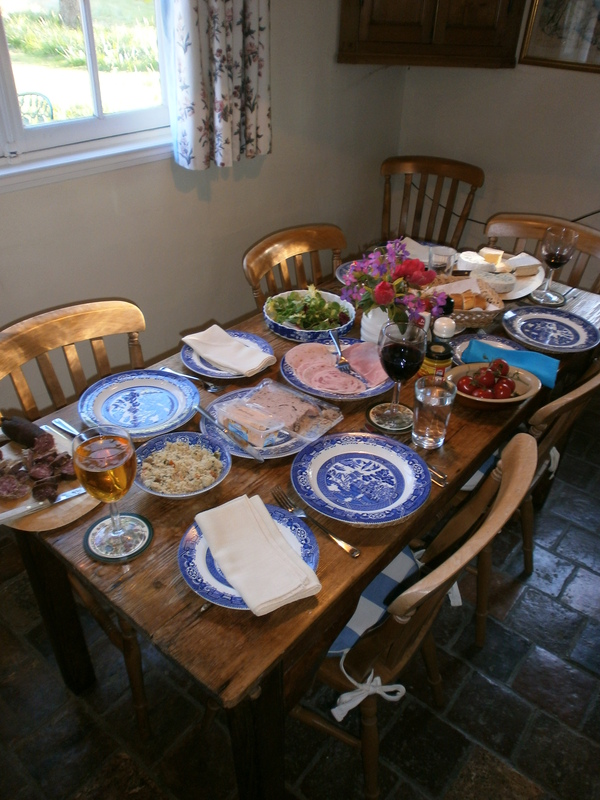 However, when booking it is often useful to ensure that you know what you need to say in advance; everyone was rather confused when my Dad enquired whether he could book a table for four people for last night…..!! 9. 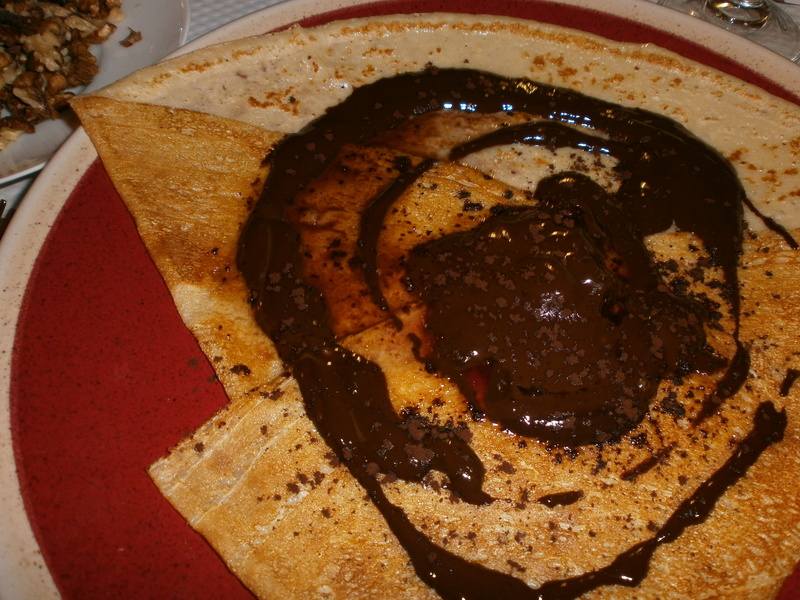 Discover that crepes aren’t just a dessert and can be eaten for more than one course during a meal! We visited two creperies during our stay, each meal was excellent and certainly very filling! 10. If all else fails and you are feeling a bit homesick, try the local MacDonald’s which will always be just around the corner!